In its latest collaboration with Cossette and Touché!, VIA Rail is inviting the public to skip idle talk about traffic—literally. Using humour to illustrate the sheer amount of space traffic takes up in our lives, this new campaign urges people to question how they get around in the summer. The campaign includes clickable online videos that give consumers the power to skip the traffic talk in the same way they can click to skip ads. It’s an innovative advertising format developed in conjunction with the media that present the VIA Rail pre-rolls, to help bring the campaign concept to life. What’s more, the ads were designed and published as part of an ongoing storyline to reinforce the message. On social media, six-second ads feature animals in a variety of comical situations. 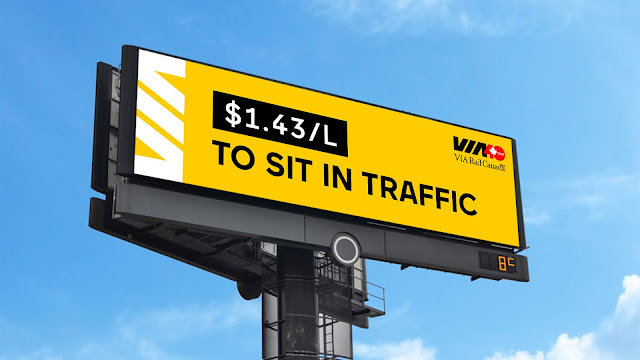 Plus, animated web banners are used to spark a conversation about the pitfalls of traffic, in addition to an out-of-home offensive to be deployed on long weekends throughout the summer. The campaign is the final instalment of the Why don’t you take the train? platform aimed at getting consumers to consider this mode of transportation.